I'm currently teaching at two locations in Ponte Vedra. I have recently moved into a wonderful new spot in Ponte Vedra where I'm teaching small group classes and portfolio development for teens. Currently I'm accepting new students for small group / private lessons at my new studio annex located in Ponte Vedra. I'm also partnered with the Ponte Vedra Cultural Center where I teach 3 classes. If interested in classes at the Cultural Center please visit them, www.ccpvb.org/arts-programs/adult-arts-programs. .
For more information about my classes, what to expect and schedules check out the Class Schedule page. Most importantly make sure to sign up to get updates! You can visit me on Facebook and Instagram too, to stay up to date. ​3 YEARS IN A ROW!! I have had the honor of being awarded as One of the Best Top 9 Art Instructors in Jacksonville Florida, by Expertise.com. This marks the third year in a row 2017, 2018, and 2019. "Scored on 25 variables across five categories. 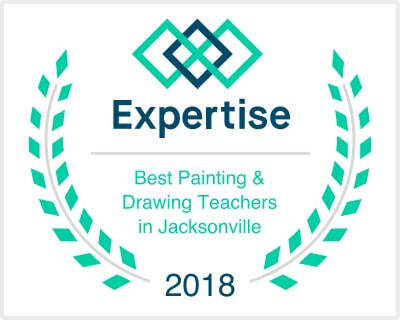 Then hand-picked the list of the best painting & drawing teachers in Jacksonville.Criteria covers reputation, credibility, experience, availability and professionalism. " ​"Marisa Yow welcomes students of all levels of skill and experience to join engaging and informative classes in drawing, oil, and acrylic painting. The Jacksonville-area contemporary American painter focuses on teaching participants the fundamentals and foundational principles of art. The talented visual artist holds an advanced art degree in painting and Art History, she has a passion for sharing her love of drawing and painting. She concentrates on teaching small group and private lessons to allow students individualized attention in a relaxed and non-intimidating learning environment. Class participants can expect to learn the necessary skills and techniques to accomplish individual artistic goals as either a hobbyist or aspiring artist. Marisa Yow conducts in-depth, hands-on sessions that help students learn to paint one-of-a-kind masterpieces." I have a personal studio inside of CoRK Arts District. If you wish to make an appointment to view my work please contact me. To keep up with happening at CoRK check us out on Facebook https://www.facebook.com/Corkartsdistrict/or our webpage http://www.corkartsdistrict.com to keep on top of our shows, openings, and events. This Studio Annex offers an intimate setting for one on one instruction in a small class environment of up to 5 students. A convenient location to the Beaches and Nocatee. Want to know what's going on. Classes, Shows, Workshops, and Events. Sign Up I send out about 1 email every two months.